If your stainless steel appliances, fixtures, and other items look as though they are trying out for the next episode of CSI, it is time to remove the evidence. 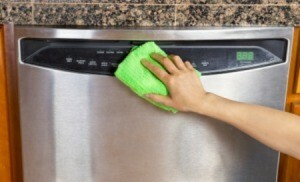 This is a guide about cleaning fingerprints off stainless steel. I got this idea when I took my sewing machine in to have a little tool up. The repairman told me he wiped it down with WD-40. I'd just brought a new stainless steel stove and couldn't get the fingerprints off of the doors after it was taken out of the box. So, why not? I tried WD-40 and, boy o boy was I ever pleased. It took off all the fingerprints and water stains from washing it down. Thanks to Morgan, my sewing machine repair guy. Source: The feather weight repairman from Scottsbluff, NE. Can anyone help on how to clean fingerprints off of a stainless steal appliance? Put some vegetable oil on a paper towel and wipe it down. It will gleam.